I haven't made a carrot cake for a very very long time. The last time I made a carrot cake was back in New Zealand because my boyfriend has never tried a piece of carrot cake before. Anyway, I began to search for some carrot cake recipes in my books and on the internet to find the best carrot cake recipe. There were recipes that used a lot of sugar and oil which is kind of unhealthy. I wanted the cake to be less unhealthy but at the same time I wanted the cake to be very yummy and moist. So, I have combined a few recipes to make my own recipe. For this recipe, I have substituted some of the sugar and oil with yoghurt and crushed pineapple. I have also replaced the white sugar with brown sugar so I could make a very moist cake. Light or brown sugar will do, I used light brown sugar because that was what I had when I baked the cake. I grated the carrots very finely so there won't be chunks or strips of carrot in the cake. If the carrots are grated finely, I find that it is easier to blend into the cake. On the day that I filmed, the supermarket didn't have any cans of crushed pineapple so I used a can of sliced pineapple and crushed them myself. Everyone has a carrot cake recipe of their own. I hope you will try my carrot cake recipe. This is my favourite and best carrot cake recipe. Here's a warning: You will fall in love with it! Mix the flour, baking soda, baking powder and cinnamon together. Sift the mixture. Make a well in the middle of the flour. Add the wet ingredients into it. Fold the grated carrots and crushed pineapple into the mixture. Grate the lemon for the zest and squeeze out the lemon juice. 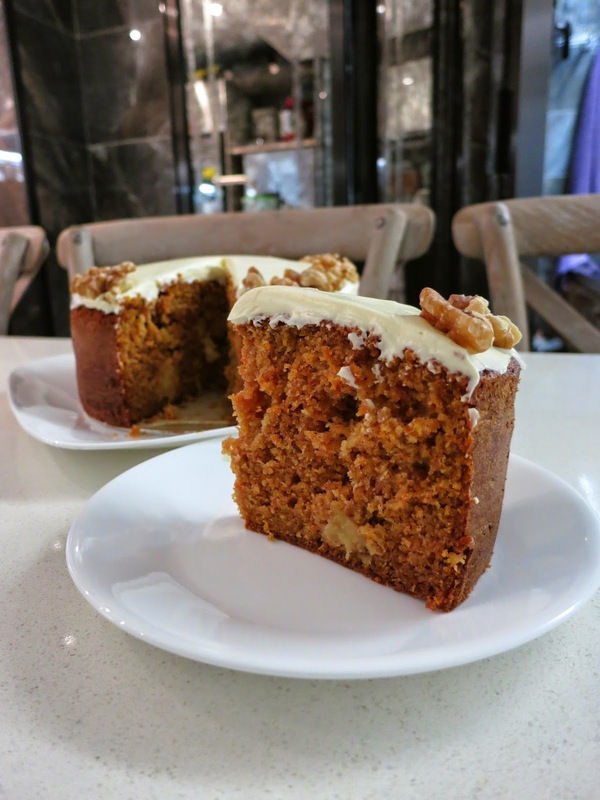 Make sure that the carrot cake has completely cooled down. Spread the frosting evenly on top of the cake. Decorate the cake with some halved walnuts.